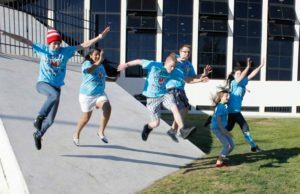 The 2012 challenge, “Rebound Rumble” (FRC 2012 Game Animation) , allowed students to erect an effective shooter and harvester, while developing a powerful drive-base with a low center of gravity for exceptional balancing. On either side of the field, four basketball hoops were displayed in a diamond-shaped pattern above a box-shaped obstacle called the Fender. A single alley on either side of the field supplied basketballs to the robots while a color-coordinated key-area provided a safety-zone for scoring robots. A four-inch-high barrier cut through the center of the basketball court, supporting three large bridges; one red, one white, and one blue. The game consisted of shooting foam basketballs into the hoops, the greatest number of points assigned to the highest goal. In the endgame, robots were given the option to balance on the bridges. Robots could either attempt to balance on their alliance bridge with team mates or balance with their opponent on the white bridge for Coopertition® points, which helped both teams significantly. boasted a swiveling shooter with camera targeting and adjustable height for scoring the top basket from various positions on the field. 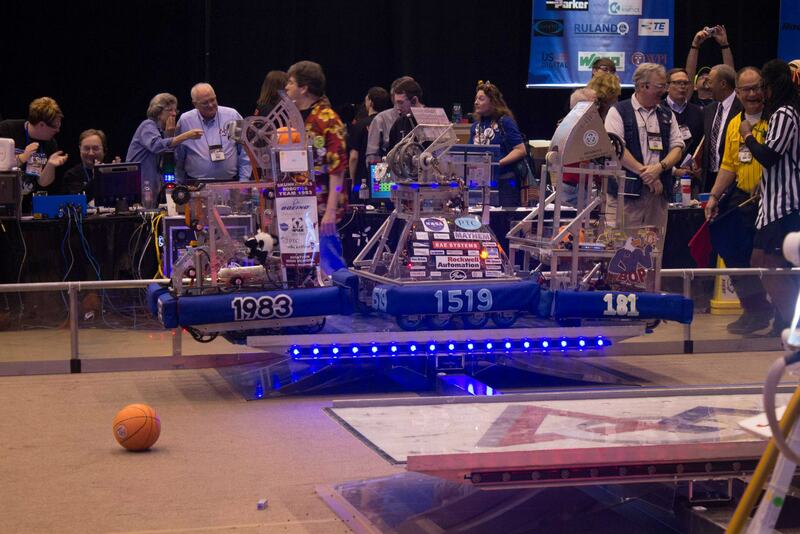 A variety of autonomous modes allowed us to either score baskets or release extra balls by tipping the bridge. For the endgame, we flicked out a wedge-shaped bridge tipper and to quickly climb onto a bridge and balance either alone or with one or both alliance partners. we fought all the way to finals against CHAOS (131), RiotCrew (58), and Screaming Eagles (1831). We won the first match, but our alliance began to fall apart due to technical and software failures. In the end, the opposing alliance won the final tie-breaker with a score of 56 to 12. During the award ceremony, our very own Amelia Jennings was honored as a Dean’s List Finalist, while Ken Bell won the Volunteer of the Year award. Our team was also award the Team Spirit award sponsored by Chrysler. That year, we were once again blessed with a NASA sponsorship grant. 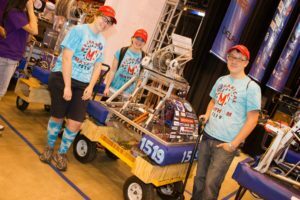 Because of their very generous sponsorship, team 1519 was given the funds to compete at the North Carolina Regional (NCR) for another attempt to continue on to World Championships. 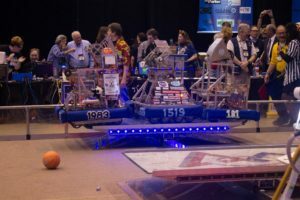 Now possessing a functional and efficient harvester, General Vesuvius proved a force to be reckoned with as it charged through the matches, ranking in the number one seed at the end of qualification matches. Teamed with the Pit Pirates (2642) from Winterville, North Carolina, and team Kellrobotics (1311) from Marietta, Georgia, Mechanical Mayhem remained undefeated all the way to the finals, winning the final match, 59 to 24. Because of NASA’s generous funding, our team was rewarded with the chance to go to St. Louis, Missouri to compete in the World Championships! 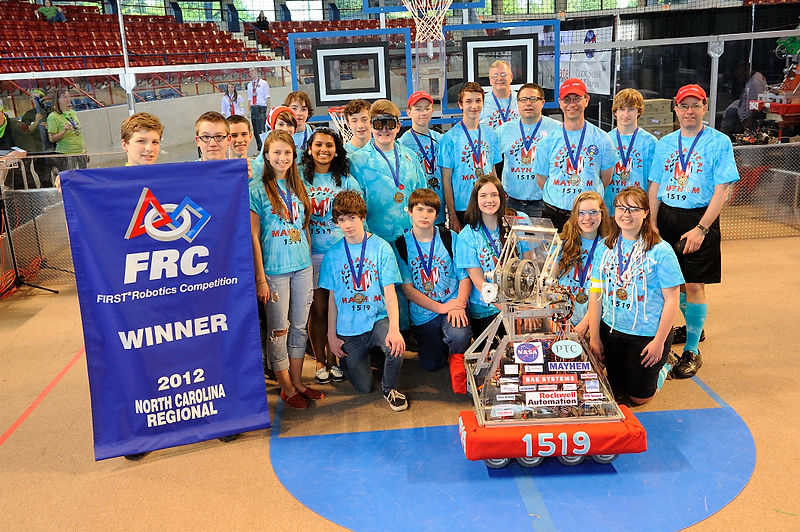 Several weeks after our fantastic win in Raleigh, North Carolina, our team competed at World Championships. Since so many robots were eligible to contend, the competition was divided into four separate fields, each one named after a prominent scientist. 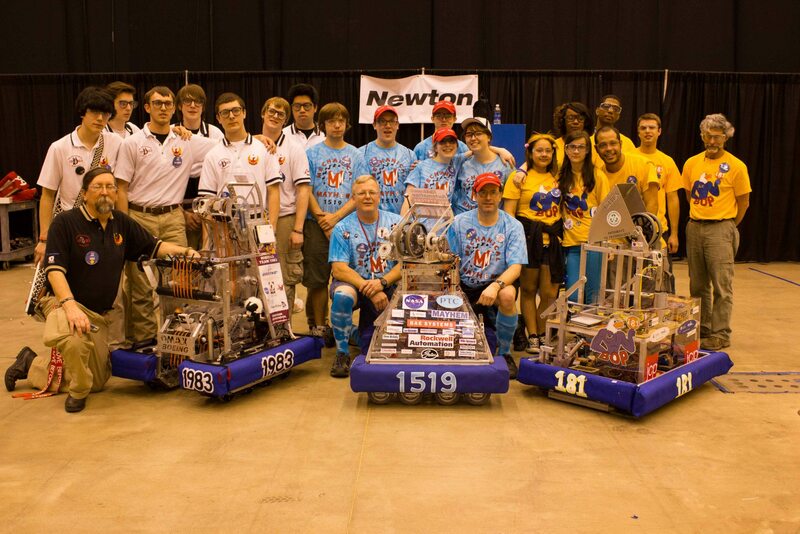 Contending on the Newton Field, 1519 amazingly landed as the fifth seed by the end of qualifying matches. Picking the Birds of Prey (181) and Skunkworks Robotics (1983) to join our alliance, we fought fervently through the quarter finals, yet came to our inevitable end in the semi finals, completing our final match with a breath-taking triple-balance. At field Einstein, where the four winning alliances clashed, the teams S.P.A.M. Robotics (180), Bomb Squad (16), and the Raider Robotix (25) reigned victorious. After the World Championships, Mechanical Mayhem attended four Off Season Tournaments for the pure enjoyment and thrill of competing. The Mayhem in Merrimack and Mainely Spirit off season events were student led efforts, although several parents pitched in. Although we only finished as finalists at the Maine Off Season Tournament, we were rewarded with the Wicked BFF award. 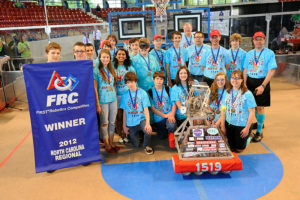 At the other three Off Season Tournaments (BattleCry 13, Mayhem in Merrimack, and River Rage), Team 1519 placed first. 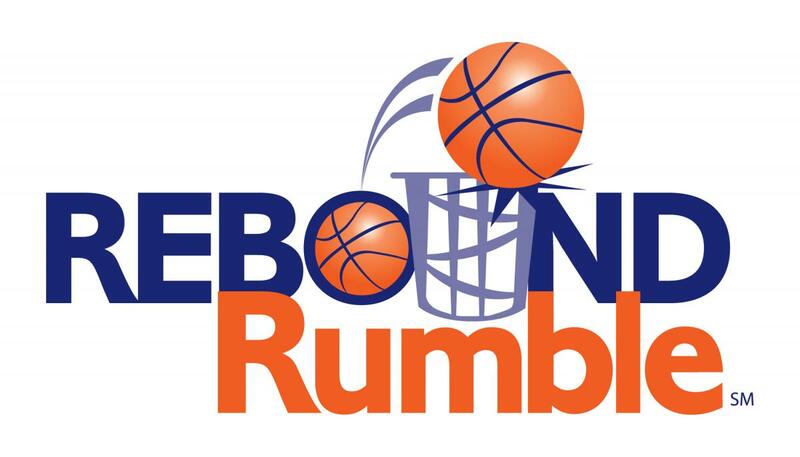 In all, year 2013, Rebound Rumble was a demanding but exhilarating challenge. Mechanical Mayhem learned teamwork as they fought through the season, working together to compete at our best potential. We tackled challenges and learned important lessons over the course of the year that will definitely help in future seasons.